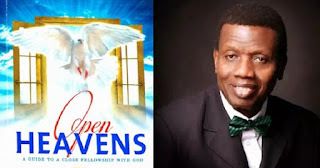 Open Heaven [30 April 2018] Progressive Prosperity - Open Heavens Daily Devotional Messages, By Pastor E.A Adeboye. When the Bible says that we should study to show ourselves approved unto God, it means that we should study the successful heroes of faith who have gone ahead of us and learn their ways (2nd Timothy 2:15, 1st Corinthians 10:11). A very good example of someone who experienced steady and progressive prosperity is Isaac. If you want to have steady and progressive prosperity like Isaac did, wisdom demands that you learn his ways. How did Isaac manage to become so prosperous in the time of famine, so much so that the king and natives of the land in which he sojourned envied him? What else did Isaac do that earned him steady and progressive prosperity? He sowed in the land (Genesis 26:12). If you don’t engage your hands in something the Lord can multiply, your expectation of steady and progressive prosperity will end in disappointment. The Almighty God knows the appropriate time for whatever a man puts forth his hand to do. It is counter-intuitive to sow in the time of famine, but God knew this was the best time for Isaac to cash in on the demand created by scarcity. This the reason why God is telling you to seek His face before you embarks on that project at hand. Isaac prospered progressively because God was in his business. Have you invited God into your business as the Senior Partner? Does God call the shots in your business transactions or you don’t even involve him at all? Do you pay your tithes? Do you give offerings? Do you honour God with your first fruits? Learn from the life of Isaac today.